How do HDD operations in urban environments differ from operations in open environments, particularly when installing pipe? The execution of a HDD in an urban environment is technically the same as for an open environment. The main difference is not what is happening below ground but what is happening on surface. Space will be constricted and smaller footprints will be utilised, equipment will need to be configured to individual sites to allow for efficient and safe drilling operations. On pipe side it becomes increasingly difficult to string long lengths of pipe in one continuous length so alternatives will need to be evaluated. These may include performing tie-in welds during insertion, or using HDPE which is more flexible than steel and easier to handle. Also pipe trailers can be utilised for smaller diameter coiled pipes. How has HDD’s use benefited urban environments? The key benefits enjoyed by both contractors and residents alike, is the reduced amount of open trench excavation, reduced time of construction and reduced amount of reinstatement. Open trenching can be difficult and time consuming in an urban environment due to the need to expose, protect and support existing services that cross the alignment. Often these trenches, curbs, pavements and roadside easements are then prone to future settlement after open trench has been used, which is eliminated if using HDD. What are some of the key considerations when using HDD in urban environments? The crossing design must take into consideration the increased density of infrastructure both above and below ground including; road, rail, foreign services, foundations, power poles and overhead cables. Undertaking a DBYD enquiry and site inspections should be used to identify all services, these services should then be proven by potholing of GPR to confirm their exact position and depth. The execution of the works should then consider any potential impacts on adjacent residents and/ or businesses including; traffic management, noise, dirt on roads, working hours and lighting emissions. What are the main challenges of using HDD in urban environments? Engineers are required to correctly identify all potentials risks and design the crossing appropriately, ensuring the crossing design allows for safe access, appropriate space for equipment setup, suitable pipe handling methodology and a profile design that provides adequate separation to all infrastructure and services both present and future. What are some of the types of projects in urban surroundings where HDD would be utilised. Due to the vast array of differently configured drilling rigs available today HDD can be used for all types of pipe installation in urban environments. Compact, silenced, powerful rigs with automated rod loading, built in power generation and on-board pumps all simplify the drilling operation and reduce the required footprint. HDD is commonly used for pressured water supply, pressure or graded wastewater, electrical conduits, telecommunications and gas supply networks. Has Stockton Drilling Services been involved in any urban HDD operations? 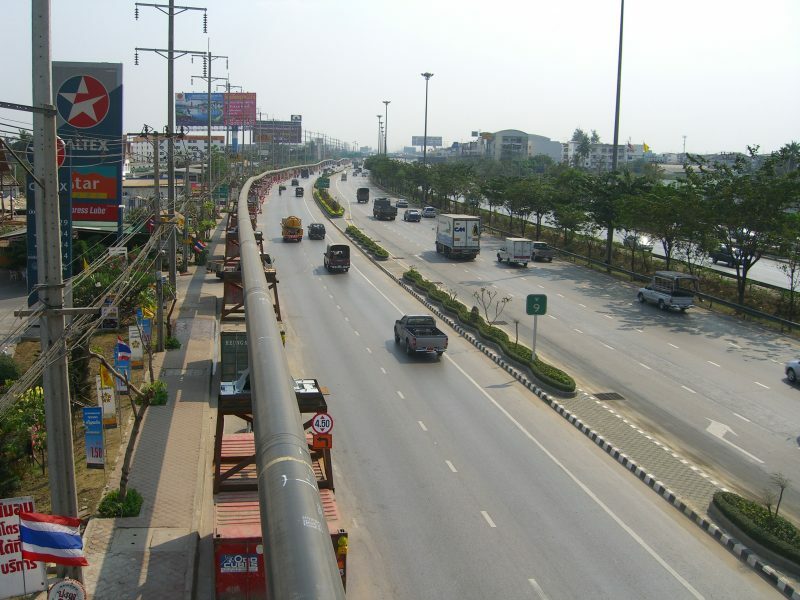 One of the most challenging urban environments where I was responsible for the pipeline design was in one of the worlds most congested cities; Bangkok where there are over 8 million residents. Even though there is hardly space to walk never mind drive a rickshaw we had to design 28km of 30” high-pressure steel pipeline to be installed by HDD. The plan I developed was to drill the section as 16 crossings each between 400m and 1600m long. 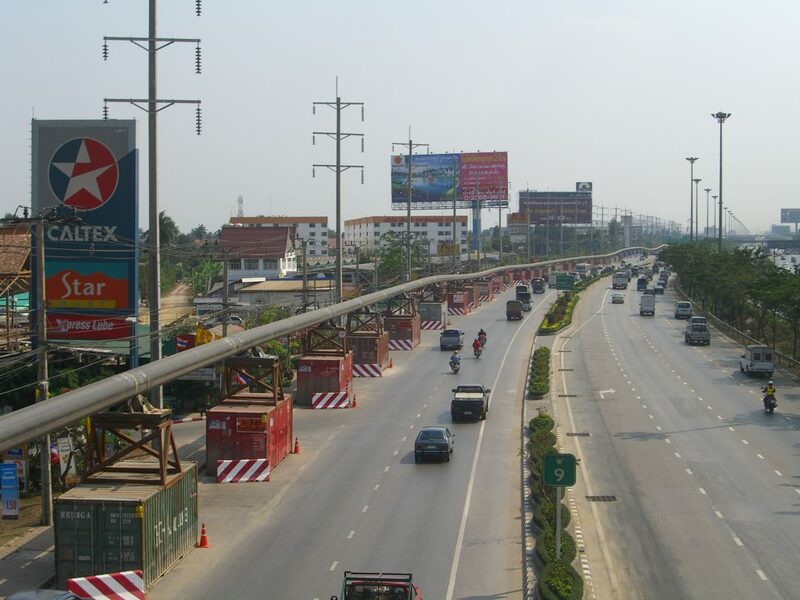 Due to the rapid development and expansion of the city limits there was no space available for pipe stringing once the project was finally underway and imaginative strategies had to be developed including welding and stringing on top of shipping containers and floating strings out by threading them along the canal network of khlongs.